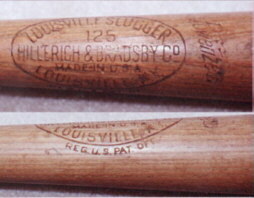 There have been a number of labeling changes to Hillerich & Bradsby (Louisville Slugger) bats over the years. On this page I will briefly outline some common information regarding labeling periods. I am sure that many know these labeling periods like the back of their hand. However, if you are not familiar with the different labeling periods please use this information as a guide.  It is essential, once you have determined that a bat has all of the correct marking and characteristics to make it professional model bat, to determine when approximately the bat was produced. 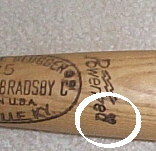 A bat that was produced during a period after which a particular player has already retired would likely not have been used by the player during his career. Rather, it would likely be either a Pro Model bat or a coaches bat. Furthermore, a bats rarity and value is dependent on when it was made. Many collectors will pay a premium for bat that were used earlier in a players career or during a particularly significant period (i.e. a Maris bat from 1961 or a McGwire bat from 1998). 1950-1960 In 1950 H&B began putting "REG. U.S. PAT. OFF" underneath the center oval. This replaced the "TRADE MARK REG." which had been there previously. Please notice that the wording begins under the O in Louisville and ends under the letter K in KY. Also, notice that the & in "H&B" in located under and between the 1 and 2 in "125". 1961-1964 In 1961 the type set changed in the wording "REG U.S. PAT. OFF." and is now a smaller font. Also, notice that the & in "H&B" is directly below the 2 in "125"
1965-1968 In 1965 the entire "REG. U.S. PAT. OFF." 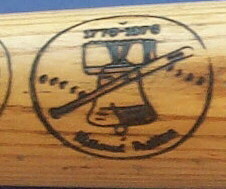 is dropped and replaced with the (R) Registered Trademark is placed after Louisville Slugger in eh center oval. 1969-1972 The change in 1969 is very subtle. The labeling is the same as the 1965-68 era except for the P in the word Powerized just above the center oval. Notice that the P in Powerized is flush in the 1965-68 era where as the bottom loop of the P now cross over. 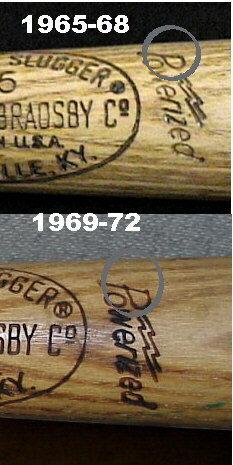 1973-1975 In 1973 a (R) Registered Trademark is place above the d in Powerized just above the center oval. 1980-1982 1980 marks a significant change in labeling for H&B. 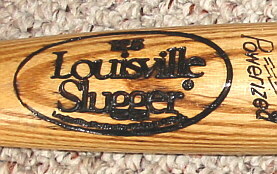 The center oval stamping is completely changed to read LOUISVILLE SLUGGER. The oval is rather large measure about 4.5" across. 1983-1986 In approximately 1983 (note there is some overlap during that year) the center oval is made smaller to only measure 3.5" across. Subsequently the 125 also shrinks significantly. Also note that sometime in 1985 and running into part of 1986 player signatures are foils stamped on eh barrel rather then burned. 1990 In 1990 the LOUISVILLE SLUGGER under the player's name is dropped completely. 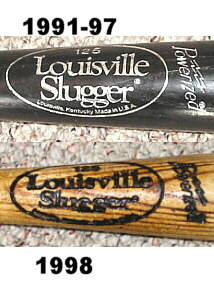 1998 In 1998 the font or type set for of LOUISVILLE SLUGGER in the center oval changes and becomes shorter and wider. The difference is subtle. 1999-2001 Beginning in 1999 the MLB logo is stamped on the barrel. Please note that some players requested that this be removed during this time (i.e. A ROD).